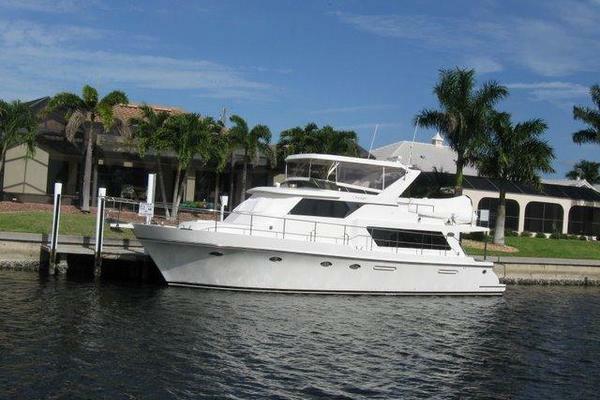 United Yacht Sales New Jersey would love to guide you through a personal showing of this 53' Tiara 53 Flybridge 2018. This yacht for sale is located in Roche Harbor, Washington. For pricing details or a showing please contact us by filling out the form on this page and we will get back to you shortly! • One (1) Bomar® extruded aluminum opening forward deck hatch with built-in Ocean Air® screens & privacy covers • One-piece welded, 316L S.S. 1 1/4" bow rail, staff, & Tiara burgee • Flush forward anchor locker with overboard drain • Concealed Lewmar CPX3 automatic rope/chain anchor windlass system with Lewmar's handheld tethered deluxe remote control & a switch at helm. Includes one (1) 12" S.S. foredeck cleat,300' chain rode, & 20 kg/44 lb. Lewmar® DTX stainless steel anchor. • Windshield cover • Recessed chaise lounge sun pad with cup holders and handholds. Upholstered in white vinyl and includes weather cover.